Fabiana Bravo, as Elizabeth of Valois, gets into character during a dress rehearsal for the HOT opera "Don Carlo" at the Blaisdell Concert Hall. Betrothed to Prince Carlos, she is instead married off to his father, Philip II, sparking a love triangle. Opera is so Eurocentric that we forget that it is a worldwide phenomenon. At least it is for singers. Soprano Fabiana Bravo, for example, hails from Mendoza, Argentina, and even though Argentina is the eighth largest country in the world and has produced a number of excellent voices, we don't automatically think "gaucho" and match it with "opera." Unless you consider "Evita" opera. 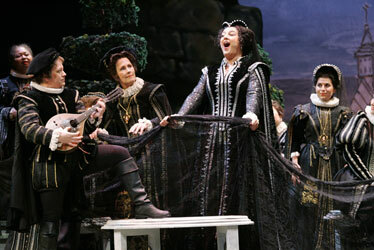 Hawaii Opera Theatre presents "Don Carlo"
"But we have fantastic theater," lightly protested Bravo. "There are only two opera houses in Argentina, but there are many, many theaters for musicals." She went on to explain that she cut her teeth performing Broadway-style musicals, buoyed by her love of singing. And if the thought of Spanish-language editions of "Oklahoma!" performed on the savage pampas doesn't blow your mind, here's another: Bravo's ethnic heritage is part Lebanese as well. Any musicals set in Beirut? Bravo is in town to perform the belle d'amour spark plug in Verdi's "Don Carlo," the opera that has so many variations it should be given edition numbers like software or Super Bowls. Hawaii Opera Theatre's season-opening production is the Italian edition: Verdi's original French version is "Don Carlos," and it takes place in Spain. Talk about Eurocentric. Bravo plays Elizabeth of Valois, betrothed to Prince Carlos, but instead married off to his father, Philip II of Spain. She's part of the political booty from a peace treaty -- that's the way things went in 16th-century Spain -- but the prince has a raging case of green monster. He's jealous that his father, the king, gets to boom-chika-bow-wow with the hot-blooded stepmom. Carlos gets down with plotting sedition against the king, deciding to help the poor folk of Flanders, who are groaning under the Spanish heel. It's all pretty much a true story, BTW, but that doesn't mean it's realistic. Nonetheless, it's an excuse to sing gloriously. Bravo says, "Now is the time to do it! It's a big repertoire, and it's heavy, but for my career, it is a payoff for much training. 'Don Carlo,' it is so big, so dramatic, you know? It's like you train to run 100 miles, but then you run 1,000 miles. It is a payoff, but you overforce the muscle. I now have a mature voice and instrument and can do it." Bravo's "instrument" has been pretty mature all along. Performing in local musicals wasn't enough. She had an uncle who saw through her "emotional screaming and singing" and suggest that "opera just might be the solution." Jessie Raven, center, stars as Princess Eboly, a second love interest for Prince Carlos. WELL INTO her teens, and with virtually no training, Bravo was introduced to opera by her doting uncle. "I could not believe it! It was so beautiful! I heard a soprano sing like the way I always heard the singing in my head and it stuck. Before, I had just opened my mouth and sang, but in musicals, it was never with emotion. Opera -- opera touched my soul. It's not like I chose it. Opera chose me." Bravo also was chosen by fabled tenor Luciano Pavarotti. A wrangled introduction led to an overenthusiastic and untrained audition, but Pavarotti saw the boundless talent and fire roiling inside, and after some vocal coaching, invited Bravo to compete in his international competition. She won it, too. "Very lucky," said Bravo. "It was the last year of the competition, and also, I debuted in opera with Luciano, in 'Lucia di Lammermoor' in Philadelphia." So much for a slow, steady climb to the top. A scholarship was tailored for her at the Catholic University of America, prompting a permanent move from Argentina to Washington, D.C. "It was Luciano who suggested I study in the U.S., not Italy," said Bravo. "The scholarship was there at the right time, but the wrong moment. It was a lot of change, all at once." Bravo discovered that the United States and Argentina have very different cultures and peoples. "It was most important, first, that I learn the language, and then the culture. You have so many opera houses in America!" 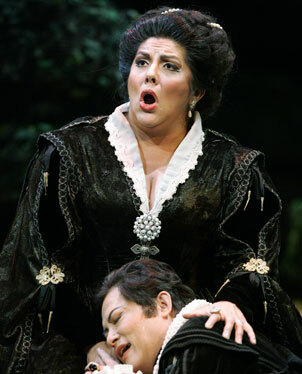 Soon, Bravo had tackled other high-profile roles in "Madama Butterfly," "Tosca" and others, scored a Plcido Domingo Operalia Finalist slot, and was then selected as a regular in the Virginia Opera company, performing regularly inside the Beltway, including, for some reason, a concert for the Supreme Court in 1999. Back in Argentina, "I'm very famous," said Bravo matter-of-factly. "I do a lot of concerts, people know me." Here in Hawaii, finally wrestling with the enormous challenge of "Don Carlo," Bravo has set her sights on a simpler goal. "First, the opera!" she declares -- and yes, she makes it sound dramatic and emotional -- "And then ... the beach!"